Tick tock, parasite prevention is changing. For years it has been said that given our Chicago harsh winters, flea and tick prevention is not required in the winter months. We previously thought it was too cold and the ticks either went dormant or died. While this can be true for some ticks, it is not true for all types of ticks. Wait. . . You are saying there is more than one “type or tick”? Yes! In Illinois alone, there are 15 active tick species. 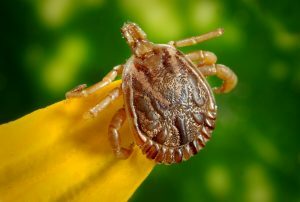 The most troublesome is the Ixodes Scapularis tick, more commonly known as the Deer Tick. The Deer tick is responsible in the spread of Lyme disease. The Deer tick has been proven to be the most active in cooler months, and locally that means the Deer Tick is most active December through February! We are in prime tick season! This past week (January 2019) we have removed ticks from several dogs in the hospital. Additionally, the Centers for Disease Control has reported in recent years a tenfold increase in human cases of Lyme disease in Illinois. These cases are not confined to rural or country areas, many of these cases have been in Cook County. Ticks are no longer confined to the woods or forest preserves. They are in our back yards, and local parks. What does that mean for our pets? We are now recommended tick prevention year-round in order to effectively prevent Lyme disease and other tick associated infections. Lyme disease is caused by a bacterial infection, and can cause systemic damage and death. Lyme disease can also cause chronic joint, heart, and kidney disease if not prevented or treated quickly enough. Fortunately, Lyme disease can be prevented with vaccination and effective tick products. For recommendations tailored to your pet, please call us.